This is the coolest copy program I have ever seen. This copy program does not use any ram within your Atari. 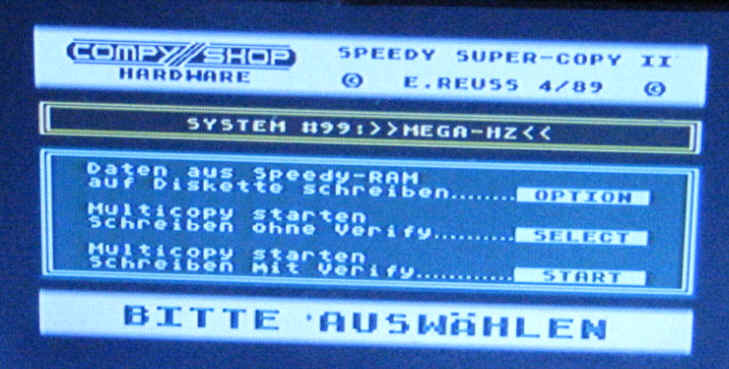 This copy program uses internal RAM within the Mega Speedy Board. The copy program copies yours your disk into internal ram in your 1050 modified with the Mega Speedy so no disk info gets transferred through your Atari SIO Buss. The Copy Program works internally with your Mega Speedy. the means it is Super FAST. Set your Rotary Switch to and press the Rotary button to set this mode. This is Super Speedy Slot 1 Mode. Now open the Drive Gate and Boot your Atari computer and this is what you should See. Copy Program Translation into English! "Abbruch" [Option] this means "Abbort"
"Einlesen" [Select] this means "Read"
"Schreiben" [Start] this means "Write"
"Ziel einlegen" means "Put destination disk in"
After pushing Select, the text is almost the same. The line at the bottom: "Original einlegen" means "Put original in"
The text "Ein Fehler ist aufgetreten" means "There's been an error"